To help raise awareness of the plight facing recent American combat veterans, a screening of the documentary movie PROJECT 22 will be held this Thursday in Elk Grove. 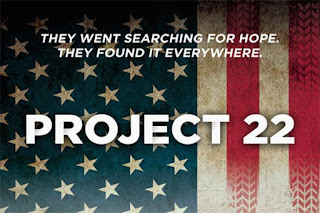 A non-profit documentary, PROJECT 22, co-directed by combat veterans, responsibly explores challenges warriors encounter and serves as a catalog of hope that will beneﬁt veterans, families and anyone who has dealt with trauma, loss or depression. During a 6,500 mile journey, two combat veterans ride their motorcycles across the country, discovering holistic methods of post-traumatic growth and meeting inspirational warriors who have overcome extreme difficulties to thrive in their lives post-military. The viewing will be on Thursday, April 14 at the Falls Event Center, 8280 Elk Grove Blvd., Elk Grove. A wine and appetizer reception will be held from 6-7 p.m. followed by the screening. All proceeds will benefit Herald-based Horses Healing Heroes - a 501(c)3. The event is being sponsored by Cosumnes Community Services Director Michelle Orrock, Elk Grove Planning Commissioner Kevin Spease, and Elk Grove Rotarian Oscar O'con in association with the Hathcock Chapter of Leathernecks Motorcycle Club. "PTSD and TBI are invisible wounds of war. It is our responsibility to ensure our Veterans get the therapy they need," Spease said. The goal of this screening is to raise money for local veterans’ support organizations that are positively affecting and helping our local veterans. Local organizers are seeking sponsors from individuals and businesses to make a diﬀerence in the lives of our local veterans. "Twenty-two veterans commit suicide every day in the United States. We can and must do more to prevent this epidemic," Chris Orrock said. "Our VA system is broken, so it is critical that we support programs that provide these therapeutic programs to our community. We are committed to helping raise funds to support these programs." For more information about sponsorship opportunities, contact Chris Orrock, 916-690-5498; Kevin Spease, 916-897-4101; or Oscar O’con, 916-919-0645.